Mix all the ingredients. & mix well. Garnish with tomato & cilantro. Wow this is indeed creamy and delicious. It looks yummy n colorful! I love anything in cheese. Mouth watering dish. 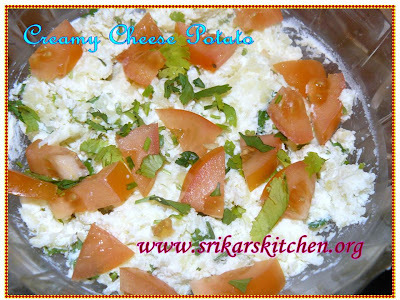 looking colorful and delicious sri..
Love the addition of cheese. Nice recipe. lovely dish.. looks very yummy priya. Yummy. Love the cheese and potato combo. Mashed potatoes with a cheesy twist??? Yum combo. Looking colorful and delicious sripriya! Its really nice idea..i think my kids like very much. thxs for the recipe.. It looks different. It should be tasty.